For other people named Gary Sheffield, see Gary Sheffield (disambiguation). Gary Antonian Sheffield (born November 18, 1968) is an American retired Major League Baseball outfielder. He played with eight teams in the major leagues from 1988 to 2009. He currently works as a sports agent. At the start of the 2010 season, Sheffield ranked second among all active players in walks (1,475), third in runs (1,636), fourth in RBIs (1,676), fifth in hits (2,689) and home runs (509), and sixth in hit by pitches (135). Sheffield hit his 500th home run on April 17, 2009. He is the nephew of Dwight Gooden. After retirement, he started to work as an agent. His current clients include Toronto Blue Jays reliever Jason Grilli. Sheffield was a good hitter in the Little Leagues. However, Sheffield had problems with his temper and attitude, which would continue in the Major Leagues. Once, when he was late to practice, his coach benched him and Sheffield picked up a bat and chased the coach all over the field, resulting in him being kicked off the team for a year. When Sheffield was eleven, he was selected to the Belmont Heights Little League All-Stars, which included future Chicago Cubs #1 pick Ty Griffin, future Major Leaguer Derek Bell, and other future MLB players. The team made it to the Little League World Series finals, but lost to Taiwan 4–3. He set a record for doubles that would be broken in 2012 by Bradley Smith. After high school, the Milwaukee Brewers drafted Sheffield with the sixth pick of the first round of the 1986 MLB draft. After being drafted he was shipped to Helena of the Pioneer League, where he had a .365 batting average and 71 RBIs in 57 games. The only question was what position he would play. He was slotted at shortstop, but struggled at the position, committing many errors and wild throws. In 1987, he was assigned to Stockton of the Class-A California League, where his defense improved and he produced at the plate. His batting average went below .300, but he led the league in RBIs with 103, and at the end of the year he was voted the Brewers' best prospect. In his third season, he went from Double-A to the majors. In 134 games for the El Paso Diablos and Denver, he batted .327 with 28 homers and 118 RBIs and was considered ready for the majors. On December 19, 2003, after negotiations between Sheffield and George Steinbrenner, a contract was agreed upon with the New York Yankees worth $39 million over three years. This deal included $13.5 million in deferred money and a $13 million team option for 2007. He joined a lineup that included Derek Jeter, Jason Giambi and the newly acquired Alex Rodriguez. 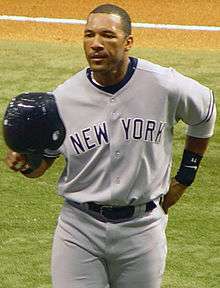 In his first season with the Yankees, Sheffield started slowly, but finished the season with 36 home runs, 121 RBIs, and a .290 batting average, helping him finish second in the MVP voting behind Vladimir Guerrero. In his second season with the Yankees, he continued to play well, hitting another 34 home runs and driving in 123 runs. 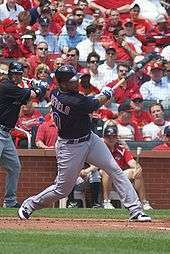 Sheffield started the 2006 season on pace for a .300 batting average and 30 homers, before he collided with Shea Hillenbrand of the Toronto Blue Jays on April 29, 2006. He tried to play despite the injury, but ultimately needed wrist surgery. Sheffield did not return until late September. He had lost his right field job to Bobby Abreu, whom the Yankees had acquired in a trade deadline transaction. At the end of the 2006 season, the Yankees picked up Sheffield's 2007 option and traded him to the Detroit Tigers. Sheffield (right) with the Tigers in 2007. On September 8, 2008 in a game against Oakland, Sheffield hit the 250,000th regular season home run in Major League Baseball history according to Baseball-Reference.com. The home run was a grand slam off Gio Gonzalez; Sheffield had hit baseball's 249,999th home run against Gonzalez in his previous at-bat. Sheffield ended the 2008 season with 499 home runs. On April 3, Sheffield agreed to a deal with the New York Mets for the 2009 season, and he finalized the deal the following day. On April 17, Sheffield hit his 500th home run in a game against the Milwaukee Brewers, becoming the 25th player in MLB history to reach that milestone, the first player to achieve this as a pinch hitter, and the first to do so in a Mets uniform. Sheffield would also become the third player in Major League history to hit home runs before age 20 and after age 40, joining Ty Cobb and Rusty Staub. Alex Rodriguez became the fourth player to do so in 2015. Sheffield sat out a game in August when the Mets declined to offer him a contract extension. On April 14, 2005, a Red Sox fan leaned over the railing at Fenway Park and swiped at Sheffield as he was going to field a ball hit by Jason Varitek. After Sheffield took a swing at him with his glove, he threw the ball back into the infield, and then got into a verbal altercation with him. The fan, who was under the influence of alcohol, was ejected from Fenway Park and his 2005 season tickets were revoked. Sheffield was fined for the incident. Charges were dismissed against both the fan and Sheffield. ↑ "Sheff prepared for Boss to lean on him". ESPN.com. Associated Press. December 17, 2003. Retrieved August 6, 2009. ↑ Beck, Jason (November 10, 2006). "Tigers acquire Sheffield for prospects". MLB.com. Retrieved August 6, 2009. ↑ DETROIT (AP) (September 9, 2008). "Sheffield has 2 homers, 5 RBIs and Tigers beat A's". Yahoo! Sports. Retrieved August 6, 2009. ↑ Beck, Jason (March 31, 2009). "Tigers release Sheffield". MLB.com. Retrieved August 6, 2009. ↑ "Mets statement regarding Gary Sheffield". MLB.com. April 3, 2009. Retrieved August 6, 2009. ↑ Hoch, Bryan (July 27, 2015). "Alex Rodriguez homers on 40th birthday". MLB.com. Retrieved July 27, 2015. ↑ The ESPN Sports Almanac. ESPN Books. 2008. p. 528. ISBN 1-933060-38-7. ↑ "Gary Sheffield awards". Baseball Almanac. Retrieved August 27, 2016. 1 2 "Gary Sheffield − Awards and accomplishments". JRank.org. Retrieved August 27, 2016. ↑ "Gary Sheffield, Unplugged". CNN. August 5, 2005. Retrieved May 3, 2010. ↑ "Interfering Sox Fan Has Tickets Revoked". Reading Eagle. April 19, 2005. Retrieved 2 October 2014. ↑ "Sheffield tries to explain controversial remarks". MSNBC.com. ↑ "Indians win with walk-off hit as Carmona, Sheffield brawl". CBSSports.com wire reports. September 19, 2008. Retrieved September 20, 2008. ↑ "Sheffield given four-game suspension: Tigers slugger won't appeal, begins serving it Monday" MLB.com, Jason Beck, September 22, 2008. Retrieved on 2008-09-26. ↑ "MLB Will Not Punish Sheffield For BALCO Admission". San Francisco: KTVU. 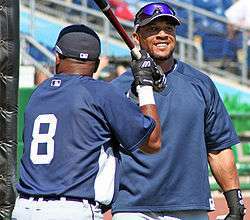 Wikimedia Commons has media related to Gary Sheffield.